Not particularly "real food," but I figured I'd document how I make Christmas lasagna. My family of origin is half Italian, so we always had manicotti and stuffed shells for Christmas. When I grew up and had a kid, I decided to do something similar. We always had leftover turkey in the freezer still, so no sense doing another anyway. But being a lazy sort, I decided ricotta in pasta would be much simpler with lasagna noodles than stuffing manicotti shells. So that is what I was aiming at with my lasagna; it's not traditional with bolognese sauce and ragu. I made a pot of meatballs and sweet Italian sausage on the side. I was going for a cheesy ricotta thing here. It also let me participate more fully in Christmas. 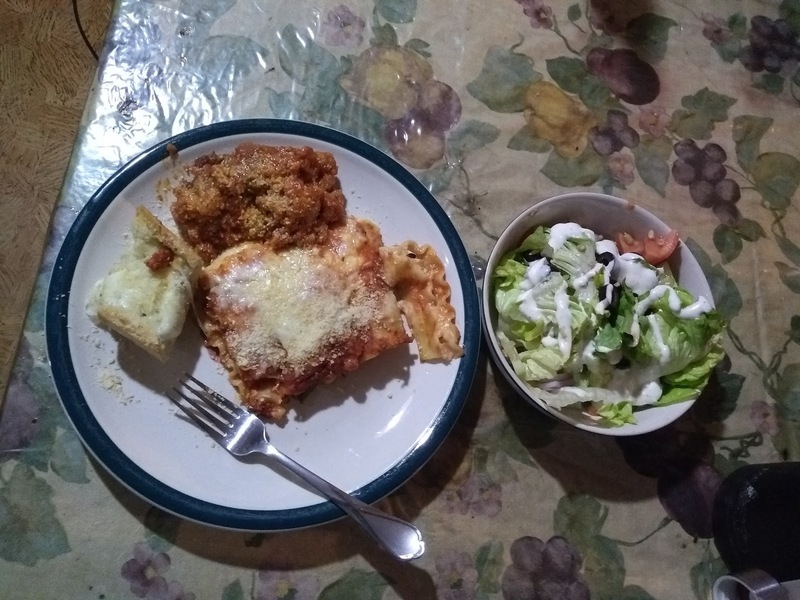 I'd make homemade sauce a few days before, cook the meatballs and sausage a couple days before, assemble the lasagna and garlic bread and make a giant salad the night before. That way, I could be in the living room where all the action was all day, only having to pop in the kitchen long enough to reheat the pot of meatballs and sausage and throw the lasagna and garlic bread in the oven. 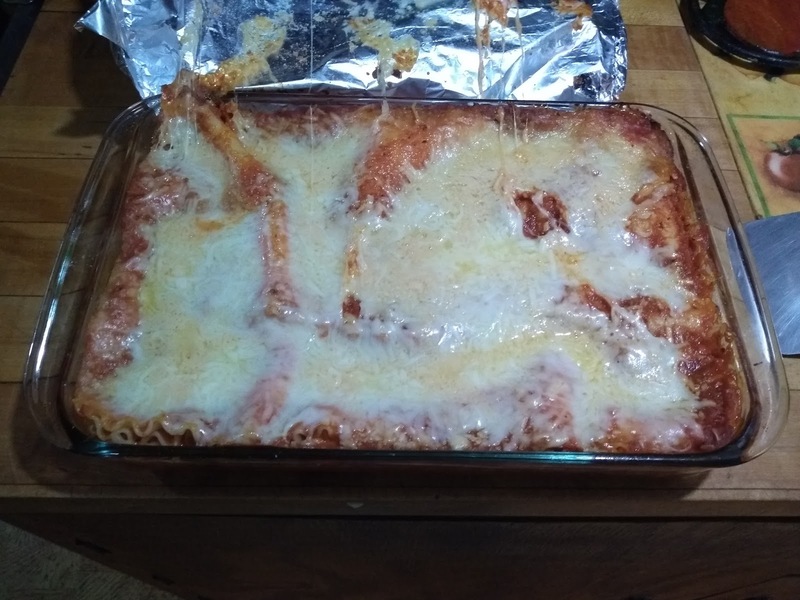 This is what has been "traditional" wherever I've lived and whoever was showing up for the holiday my entire life; the few occasions I showed up to someone else's home for the holiday, I brought a lasagna. My recipe makes 2 lasagnas, as that's what a one pound box of noodles makes. With larger groups, I just do that. For a holiday like this one, with just me and my husband, I froze the second one for another time. But I've also halved the recipe; you just have to get the smaller container of ricotta and remember not to cook all the noodles. Ingredients matter. You want to use whole milk ricotta and whole milk mozzarella, not the part-skim stuff - this recipe is intended to be amazingly yummy, not low-fat! If you want a low-calorie dish, don't make lasagna. And no, you cannot substitute cottage cheese, which is a perfectly fine food, but not in lasagna. You want a mild-flavored sauce, not something with intense flavors, to let the cheese shine through. If not making my own, I buy a mild marinara. The herbs are fine to use dried if you don't have fresh. I prefer using flat-leaf parsley; the curly stuff taste like nothing to me. I also prefer to only use dry oregano, even if I have some growing; it tastes more flavorful to me. I made this when hubby first came down from Canada to visit me. This is how good it is: the man married me! In large bowl, beat the eggs. Add the ricotta, 1/2 cup of Parmesan, and all the herbs and mix well. Cover with foil and bake about 45-50 minutes at 350. If you like the top layer of cheese browned, remove foil for last 5-10 minutes of baking. TIP: If you despise part of the noodles becoming crunchy, as my husband does, make sure the noodles are FLAT on top (some lasagna pans have curved corners, you have to sort of tuck the noodle under). Save a bit of extra sauce to make sure the noodles are well covered, and consider foregoing the baking with foil off.